Recently we met Guy, who repairs cane and rush seats. He comes once a year to Preuilly and parks his camping car on the old municipal campsite by the (now sadly closed) Claise Restaurant. He puts up a sign saying he does 'repairs, rerushing, caning, regluing and springs for chairs and armchairs, pick up and delivery from your home' and sometimes calls door to door to ask if householders have any chairs they want repairing. He is fairly well known in the district and seems well integrated into Preuilly's annual cycle. He is a gypsy (the term he uses, by the way) and says he likes to keep things simple. Guy's sign and a few chairs to advertise his work in front of his van. Cane and rush work is closely allied to basket weaving, which he also does. It seems these are traditional gypsy activities, because there are often gypsy women selling baskets at in the supermarket carpark in Yzeures. They come from the campsite provided for gens de voyage just down the road. Guy's hands are rough and covered in lacerations from the cane. He just shrugs. His work is clearly very skilled and good quality, but he is careful not to get too proud of being an artisan, because that just leads to ideas above your station (or words to that effect). 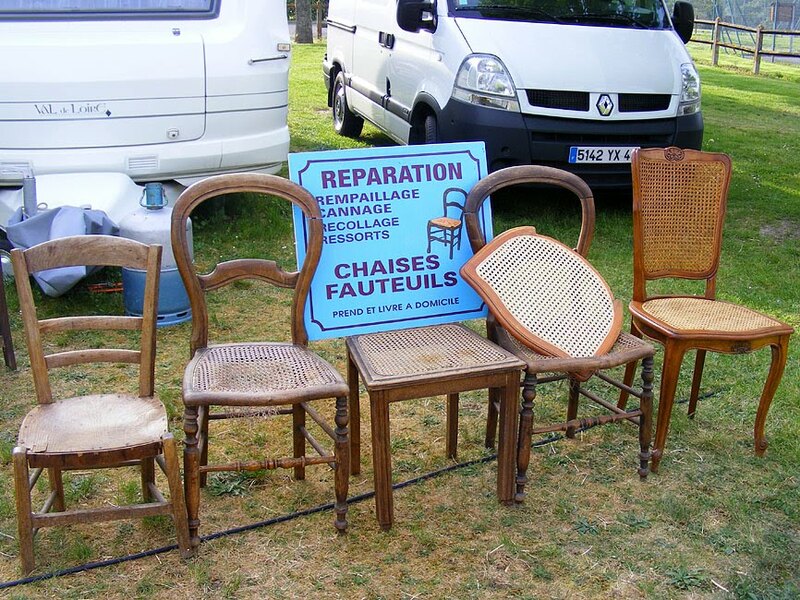 He says he has repaired chairs in all sorts of locations, from grand châteaux to a couple of chairs for a friend of ours. 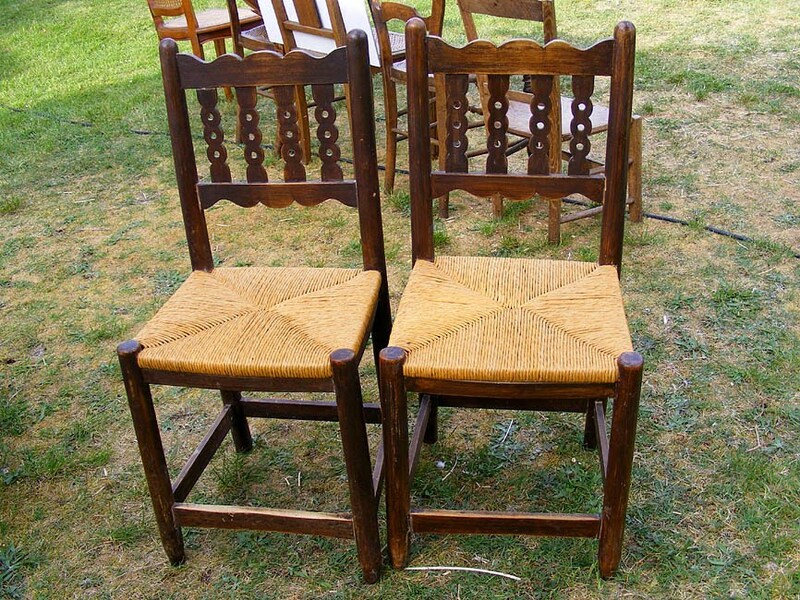 Our friend's chairs (below), restored to useful life. Guy told her off because he could tell she must have been standing on them and he had to send the seat rails off to a local menuisière (joiner) to get new ones made, as the old ones all had broken dowels. We were invited for apéro when our friend picked her chairs up and Guy explained that there are 4 or 6 thread weaves or methode anglaise, which is a 6 thread but with more complicated designs incorporated. Apparently he once did an armchair in Limoges in this method and it was a real challenge (and he didn't charge enough...) The chair was late 18th century, from India and decorated with nacre (mother-of-pearl), very rare and worth a fortune. He says it's difficult sometimes to convince clients that his fee is reasonable. Sometimes there will be someone at their local market who will do a chair seat for €50, but he warns that you will be wasting your money and only have to get it done again because the workmanship will be so poor. He showed us a neat and pretty rattan basket that he was asking €25 for, but his competition are sourcing their wares in China and selling for €5. Sadly, the punters don't care or can't see the difference. He has a number of English clients, who he likes, as they are happy to pay €250 per chair. Likewise, corners are being cut with the materials. It used to be that the artisan prepared the material he used from scratch. If he was working in osier (wicker) he would peel and soak the withies to whiten them, or dye them as required. Now you buy the material ready to use. The whole withy would be used, but now the method is to cut the withy into three strips. Do you remember all those rosettes of orchid leaves that came up in the orchard? About 250 of them, and I decided they must be Lizard Orchids. Lately I've been looking at them and having my doubts - the leaves didn't seem to be getting big enough. I began to wonder if at least some of them were Monkey Orchids. Well, I'm wondering no longer. They have just started to flower and it looks like I have a substantial colony of Early Spider Orchids Ophrys sphegodes (syn. O. aranifera. 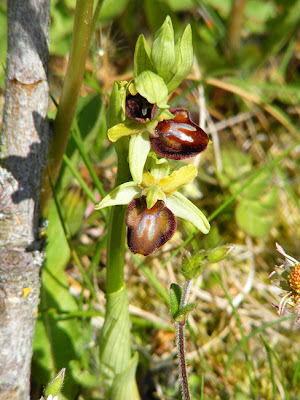 Ophrys araignée in French). I never expected that! 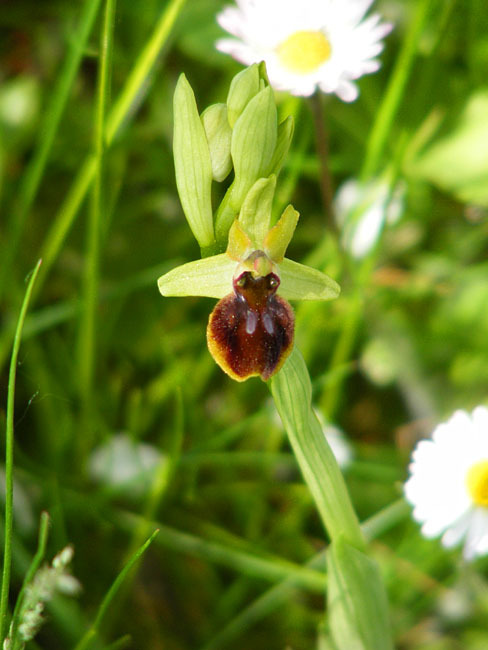 The genus they belong to, Ophrys, is one of my favourites, so I am very pleased indeed. They will continue to flower for about a month now, then set seed and disappear for a few months. They like calcareous grasslands in full sun and roadside embankments. The orchard is a sunny flower rich grassy slope, on argilo-calcaire (clay mixed with degraded limestone) soil, so perfect for this species. 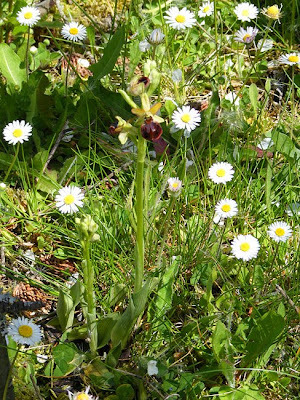 However, the neighbouring land has Lizard Orchids, and I fully expected these to be the same. The Claise valley is one of the areas where Early Spider Orchids are common though, so perhaps I should not be so surprised. This species is easy to recognise, although it is rather variable in appearance. The lower petal varies in shape as does the H shaped mark on it, and the rest of the flower is sometimes pink rather than green. If you are in the area, interested in orchids and want to see them, please email me (via my profile on the right). I am very happy to show them off to visitors. When we bought the house the kitchen was "blessed" with a quite nasty fake antique oven hood. and sooner (rather than later) you have a clear, if extremely grotty, wall so you can start insulating. 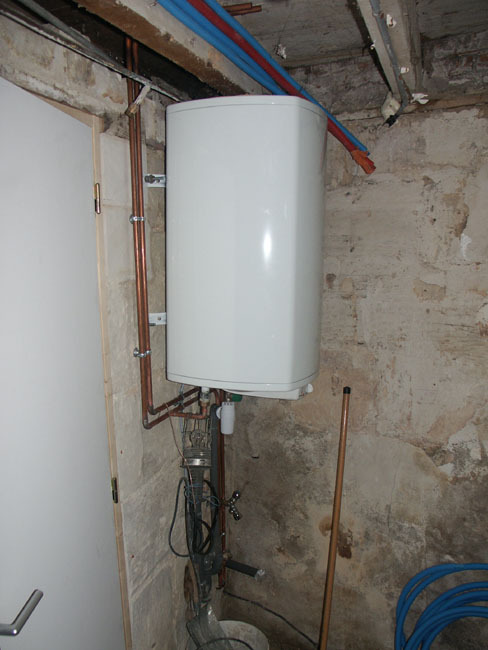 In the meantime, the plumber has been hard at work, and although it isn't yet plugged in, we have a ballon de chauffe-eau. 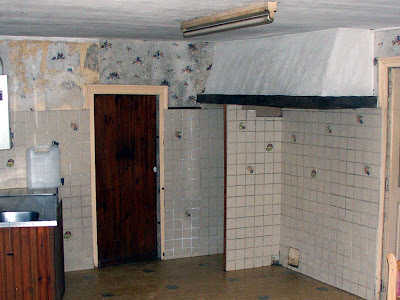 In addition to that we have the plumbing for the upstairs toilet, and the pipes and drains for the shower and handbasin. 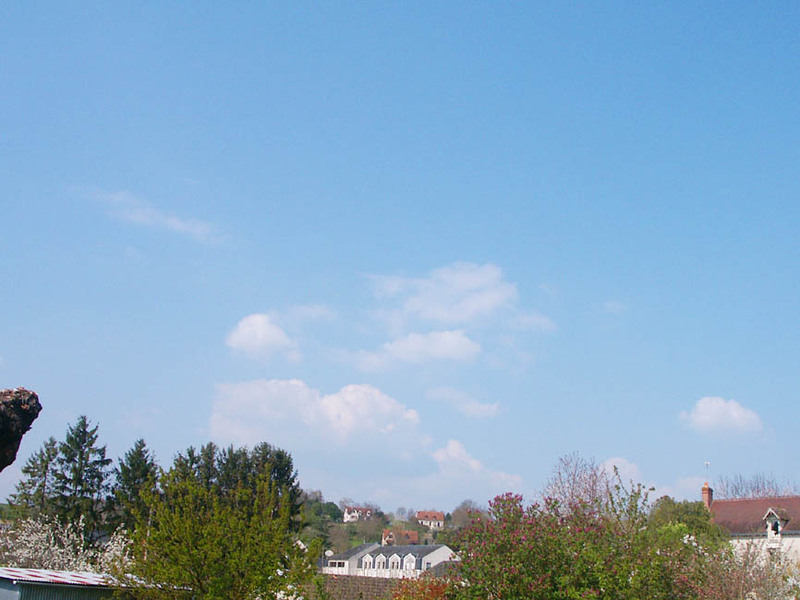 Today the temperature is supposed to reach 28°C. That is very hot for this time of year, so I am assuming we will get the hot water installed and running just in time to start taking cooling showers. 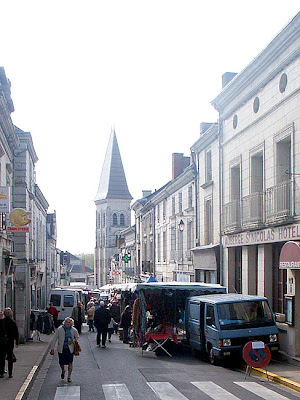 We mentioned the other day that St George is the patron saint of Preuilly sur Claise. This is the first year we have been here for the fair that happens on the first weekend after April 23 - in previous years we have missed it by a matter of days. 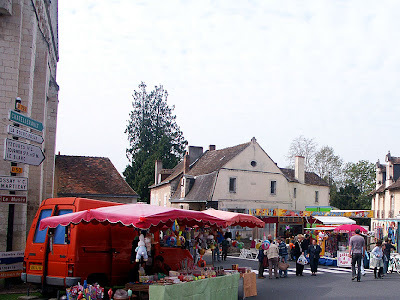 We went out to the marché on Saturday morning as usual, to find that our street had been blocked off, and that instead of the usual 5 or 6 stalls in the Place des Halles there was brocante and other stalls lining the place, as well as the Grande Rue. The stalls went all the way down to the abbaye, and across the bridge. At the abbaye itself was a funfair, with shooting galleries, various rides (none, it must be said, too frightening) and dodgem cars. We strolled down to the end of the stalls, looking at the usual collection of stuff, some of which I am sure I have seen on other people's stall at other brocantes, but with one or two very nice items scattered around them. We didn't buy anything though: what with the plumber due to start work we are aware of the money situation, even though we have a perfectly reasonable devis for the work. 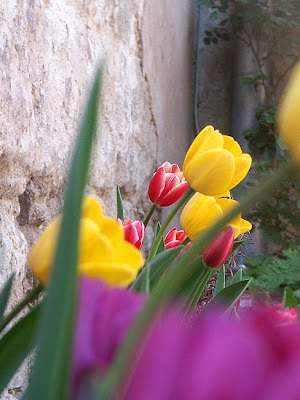 We wandered back up the Grand Rue towards the mairie, a process that took some time as the whole town was out enjoying the activity and some lovely spring weather, and of course there was plenty of news (and not a little gossip) to catch up on. Once at the mairie we stopped for a bite of lunch, sausages and chips, followed by cakes made by the kids at the primary school. While we were sitting there various friends and acquaintances stopped to say hello and had a drink with us, and we enjoyed a convivial lunch. We ended up leaving the fair at about 2.30, as by that time a certain torpor had set in. 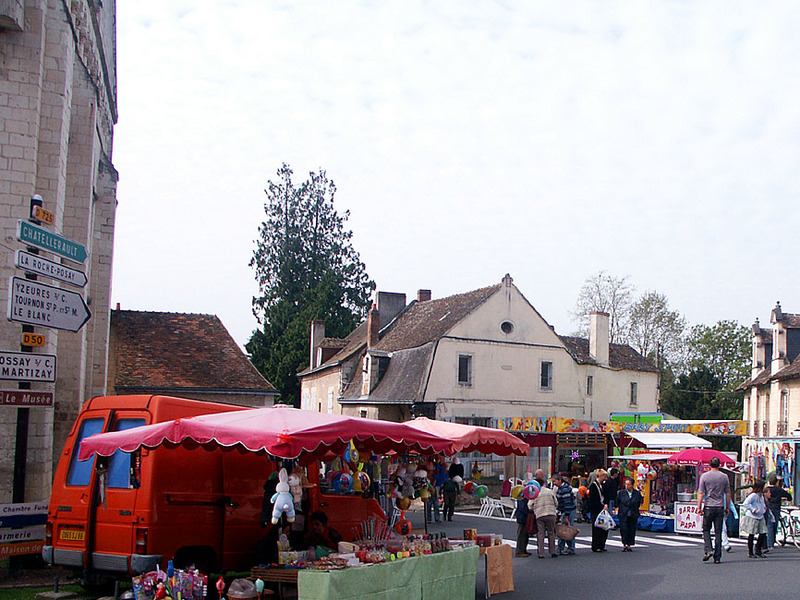 We didn't go back later in the evening, although we suspect that the area around the abbaye - where the funfair was - continued to be fairly lively until quite late in the evening. Like with the Bastille Day celebrations, we were quite surprised at how well attended the event was for what is, after all, just a small town in the middle of the French countryside. 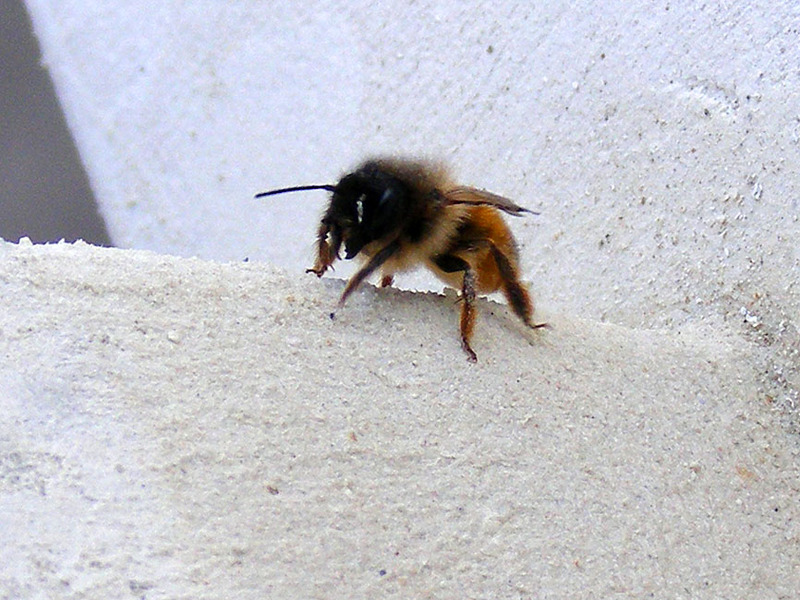 I wrote about European Orchard Bees Osmia cornuta in early April. Orchard Bees are a type of mason bee and they nest in holes in wood or masonry. All April the females have been inspecting our house for nesting potential. They don't make the holes themselves, rather they use existing holes if they are unoccupied and of a suitable depth and diameter. 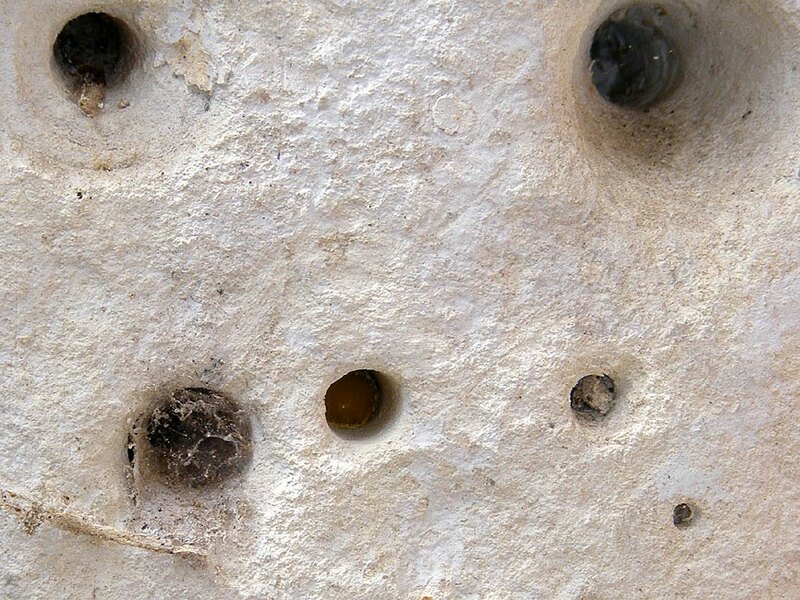 A European Orchard Bee nest hole (lower middle) in our graineterie wall. Once a hole has been identified as having potential, the female bee puts down a layer of mud at the back of the hole. Then she collects pollen and puts down a layer of that. She lays an egg in the pollen layer and seals it in with mud. 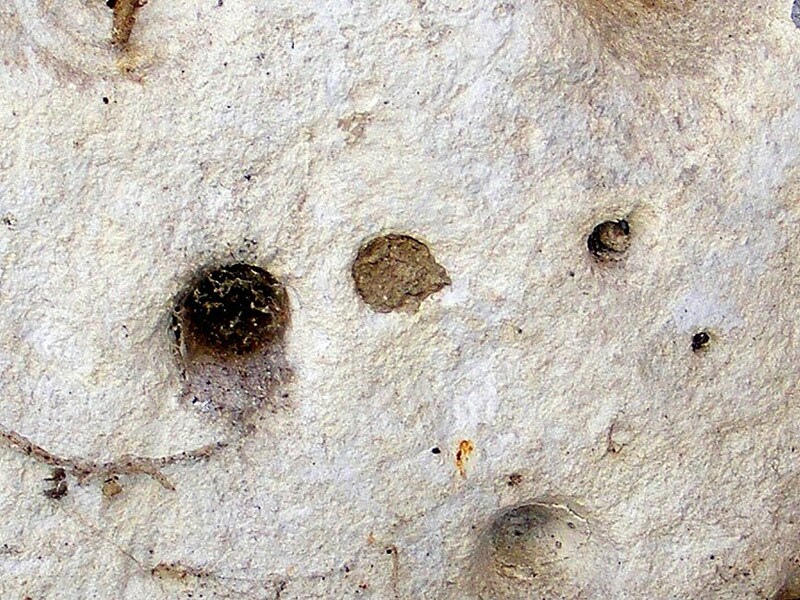 Then she repeats the pollen, egg, mud layers until the hole is full. 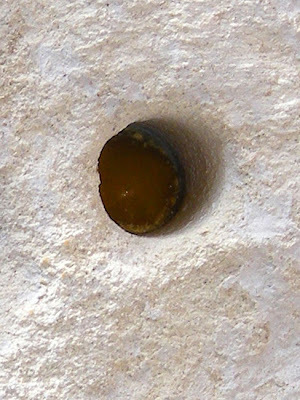 Of course, the first bee to hatch is the one at the back, who is obliged to gnaw its way through all the layers to get to the outside world. On its way it nips its siblings to stimulate them to hatch too. ...by the next afternoon it looked like this, sealed up with mud. this time in a wooden lintel on the side of our house. 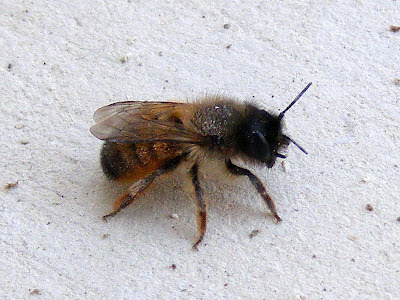 L'autre Mason Bee - a Red Mason Bee O. rufa (below), which I found on our new front window ledge. I wondered if all the stone dust had attracted her. You can see the powerful mandibles (jaws) which show their close relationship to Leaf Cutter Bees, and check out those powerful grappling hooks on her feet! Red Mason Bees are actually less red than European Orchard Bees, and emerge slightly later. Although native to Europe, they are also available commercially for people who want to improve the pollination of their fruit trees, and are therefore a much more widely known species. 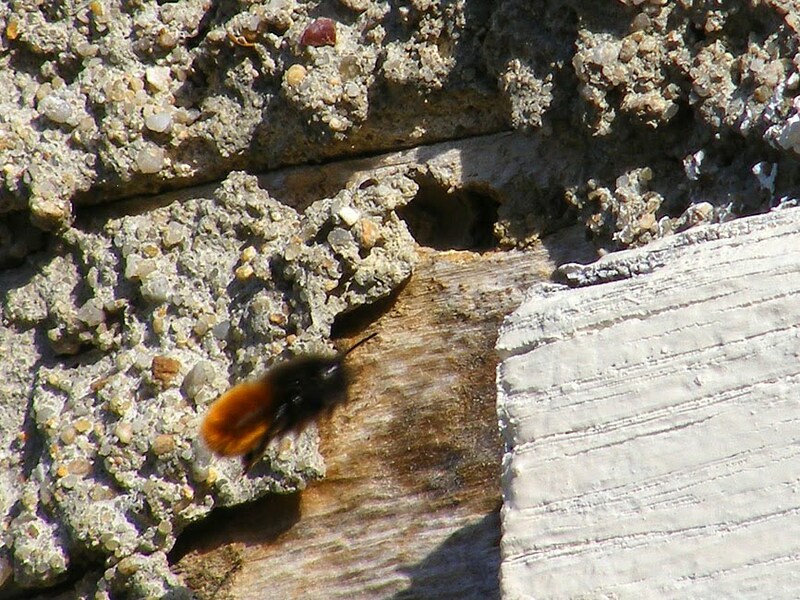 a feature of mason bees. Today is ANZAC Day in Australia, the official day of remembrance for the country's war dead. As we have written about the day several times before, I thought I would post a recipe for ANZAC biscuits instead. These are delicious, but unfortunately I can't make them at the moment because I would only be able to bake one at a time in our mini oven. I didn't make the ones in the picture either. I bought them from the Tuross baker's when we were in Australia at Christmas time. Preheat oven to 180°C and lightly grease oven trays. 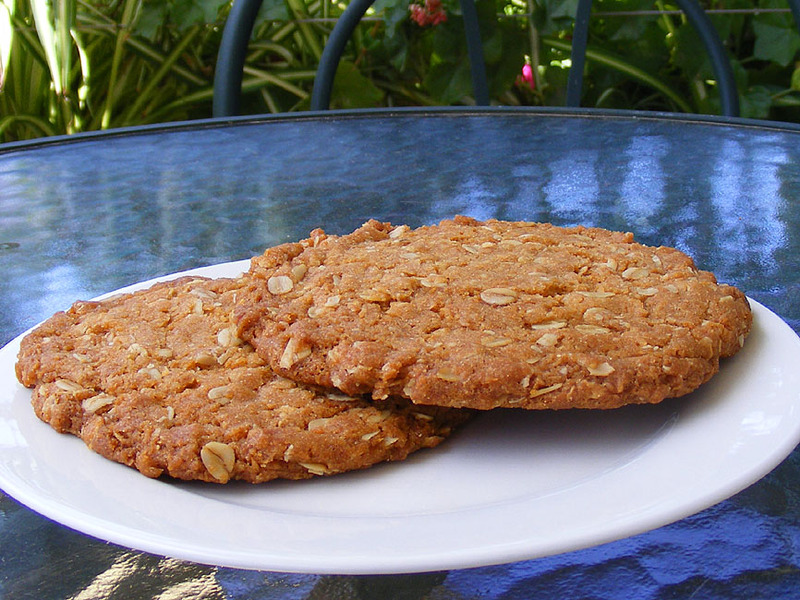 Combine flour, sugar, rolled oats and coconut. Add bicarb to boiling water and mix into butter mixture. Form the dough into large marble sized balls and drop onto trays, allowing generous room for spreading. Bake for 10 minutes until light golden brown. Cool on tray for 5 minutes before transferring to a rack to cool completely. PS Today is also Souvenir des Déportés in France, which commemorates the French men and women who were deported as forced labour, interned or sent to concentration camps during the Second World War. Alderflies Sialis spp, with wings patterned like smoked leaded glass, emerge as adults at this time of year. They've spent the past two or three years as predatory larvae at the bottom of an étang (small man-made lake) and come out now to transform into their adult body and mate. 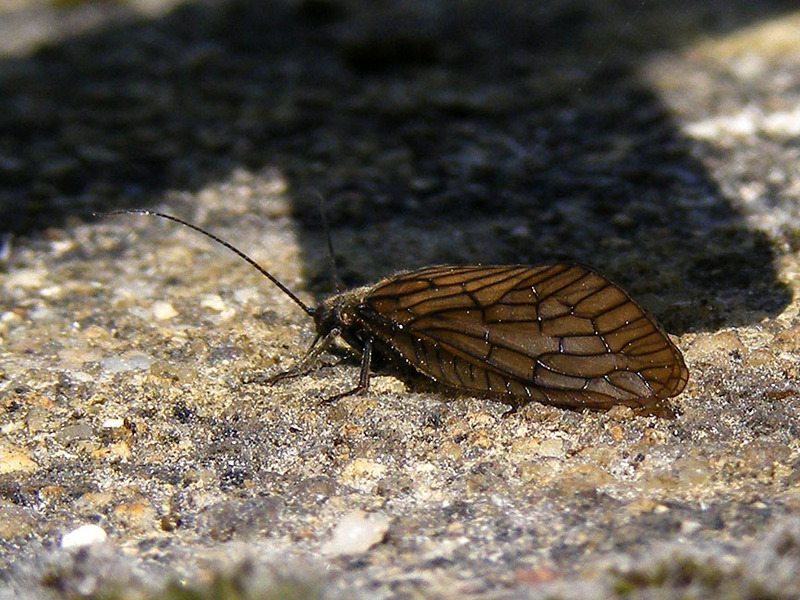 They do not eat as adults, but survive for about 3 weeks after a synchronised emergence which ensures other adult alderflies are around to engage in the main business of adulthood. 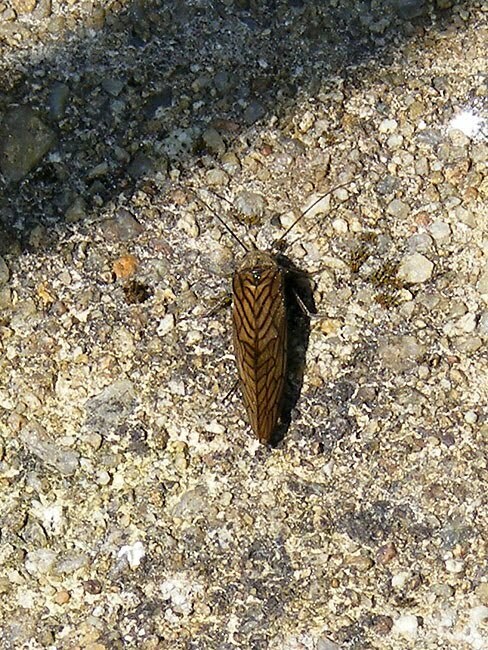 They are not a true fly at all, but a much more primitive type of insect, in a family of their own, but related to Scorpionflies. It isn't finished, because we still need to paint it the same colour as the shutters and add the glazing bars, but this is what our back door looks like. 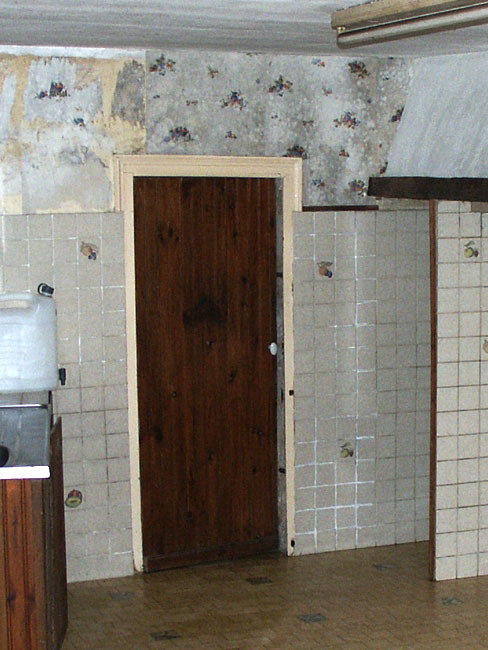 This is what the back door used to look like. 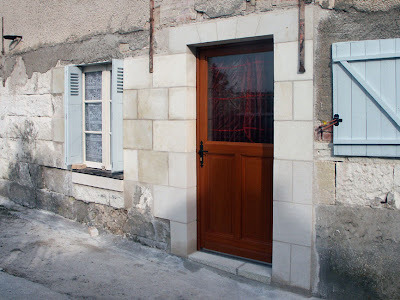 There are a number of practical improvements: I don't have to duck as I enter the house, the door won't let in the rain, wind and cold, and the stonework is solid (as is the door) and doesn't move about alarmingly. Then of course, there are the aesthetics. 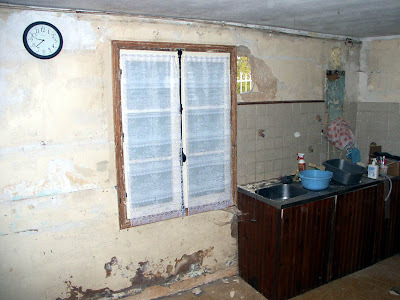 We are both really tired at the moment - Susan spent all day trying to move the dust the maçons left (we'll be shifting dust for weeks to come, no doubt) and I have been learning 1001 new skills, none of which I hope I will have to call on again (once is enough...). We are having a really interesting time though; at the moment every day seems to bring a new excitement and achievement. Today is St George's day. Not only is he patron saint of England, but also Aragon, Catalonia, Ethiopia, Georgia, Greece, Lithuania, Palestine, Portugal, and Russia, as well as the cities of Amersfoort, Beirut, Fakiha, Bteghrine, Cáceres (Spain), Ferrara, Freiburg, Genoa, Ljubljana, Gozo, Milan, Pomorie, Preston, Qormi, Rio de Janeiro, Lod, Barcelona and Moscow. And Preuilly sur Claise. 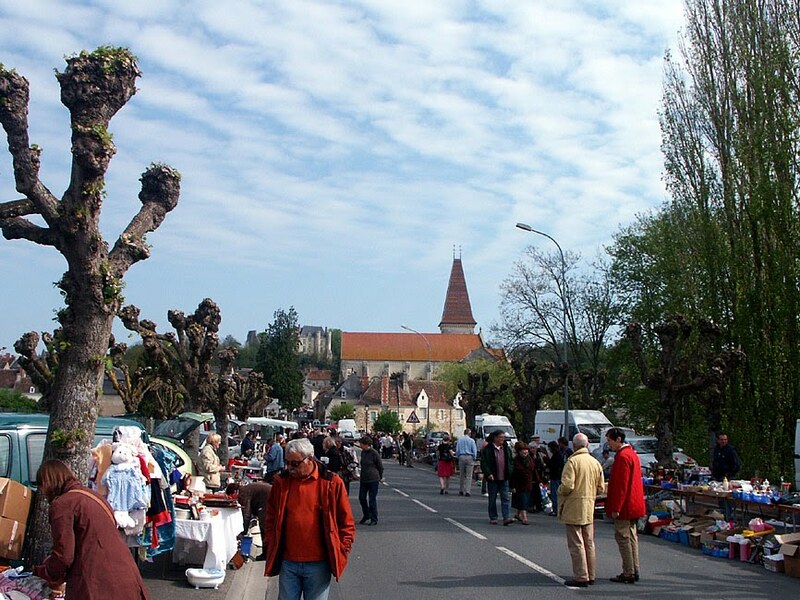 There is a big fair in town tomorrow, as well as a brocante. The town has been spruced up a bit, even to the extent of cleaning the road signs at the main intersection (although this may be purely coincidental). The door to our downstairs toilet has been a continuing sore point, especially for people new to the foibles of our house. The solid oak lintel was only 155cm (5'5") high, and was capable of catching all but the shortest people (you know who you are) unawares. Not now. 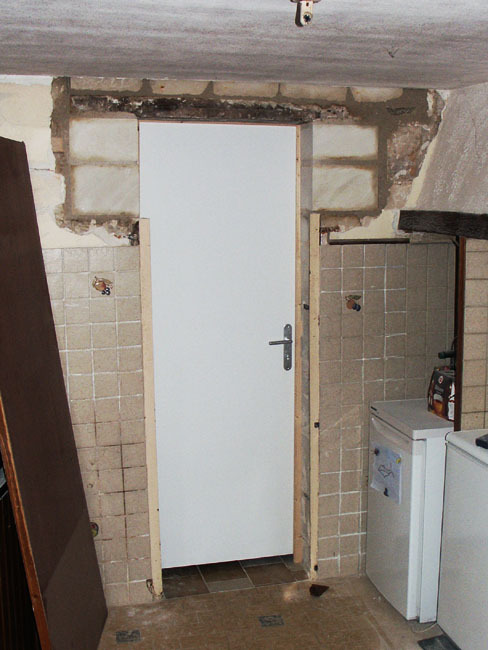 The door is now a regulation 208cm (6'10") high. Not that it stops me from ducking as a reflex action when I walk into the room. I was going to save a piece of the architrave off the old lintel, but it was so damaged (presumably by people's foreheads) that it wasn't worth the effort. The masons have now finished their work on the house, or at least this round of works. We will post some more photos of what they have been doing later in the week. Stéphane and I are still rewiring (we hope the new tableau will be in action this afternoon), and then we will be starting work insulating and closing the walls of our new entry hall - a project I am very excited about. This current round of works has so far taken three weeks, and we have got an awful lot done. Not that we are feeling smug, because we still have a huge amount of work before we are finished. Having said that - it now feels as if finishing is a real option - something we have both had private doubts about. 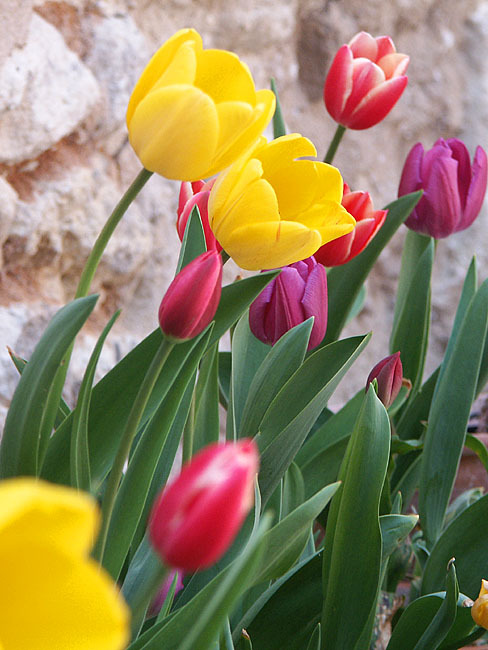 The tulips in pots on the front courtyard are putting on a fine show in mid-April. You may have heard that huge clouds of dust have stopped the airlines of Europe. Whilst not accepting all the blame, maybe we have played our small part: the masons arrived yesterday to put in our new stone lintel. This was achieved with much Gallic muttering and one or two educational phrases, none more so than when trimming the stones to fit. 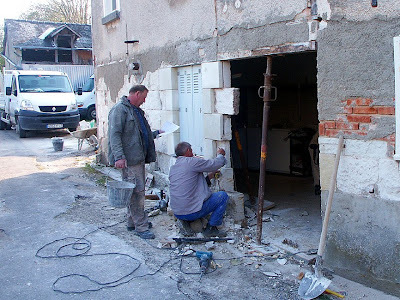 Apart from that excitement things went well: the lintel is in, the new step into the salle à manger is fitted, and work has started on raising the lintel on the toilet door. Which will please Uncle Geoffrey. Talking of the back door: we ordered it from Lapeyre 10 days ago, and were told it would be available from the 17th. On Saturday (the 17th) they rang to say it was available, but wouldn't be delivered until the 27th because the driver was on holiday. To Stéphane, this was red rag to a bull territory. 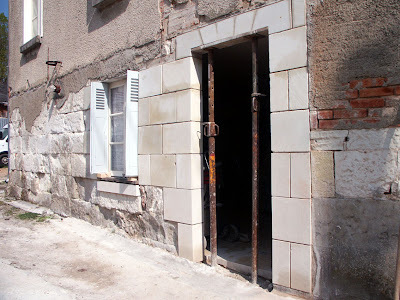 Susan and I joked that he would say "five million unemployed and they can't find someone to deliver a door" - which is exactly what he did say - to Lapeyre. The door will be delivered tomorrow. We may now have even more dust than before, but we also have real, visible progress. ...but not yet quite finished, is the apéro terrasse. When the roofers are here (in June) to replace the slate roof on the house the terrace floor will be augmented with the old slates, but apart from that, we are done. 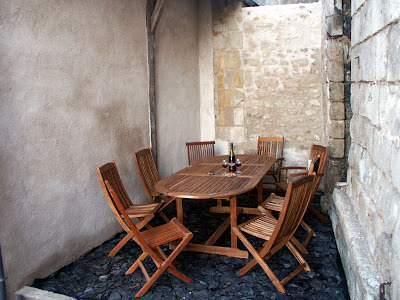 The furniture was bought at Bricomarché and is made in Vietnam from acacia wood. It's an extending table and six chairs, together with two other chairs we bought earlier in the year. We should be able to seat eight people comfortably in cool seclusion, even though the floor is black slates. The area gets very little direct sunlight (probably about 8 hours a year in total), so it will be a great place to try escape the summer heat. 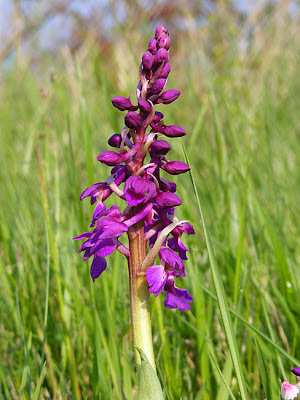 The first orchids have begun flowering around Preuilly. The very first patch is some Early Purple Orchids Orchis mascula (Orchis mâle in French) on the corner of the turn off to Rouvray from the D725, which I spotted on my way to the supermarket on Thursday. These were the first to flower last year as well. Early Purple Orchids on the Rouvray turn off. 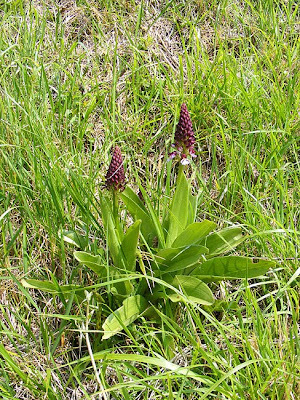 Only a day behind them are some Lady Orchids Orchis purpurea (Orchis pourpre in French) on a roadside bank at Pelchate on the western outskirts of Preuilly. 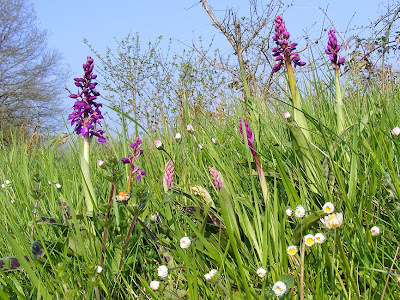 The Claise Valley, between le Grand Pressigny and Bossay-sur-Claise is by far the best orchid habitat in the département of Indre et Loire, with over 30 species. Orchid numbers, although not necessarily species, are generally much higher south of the Loire than north in the département too, with the Touraine du Sud being the main area of interest. Early Purple Orchid flower spikes. 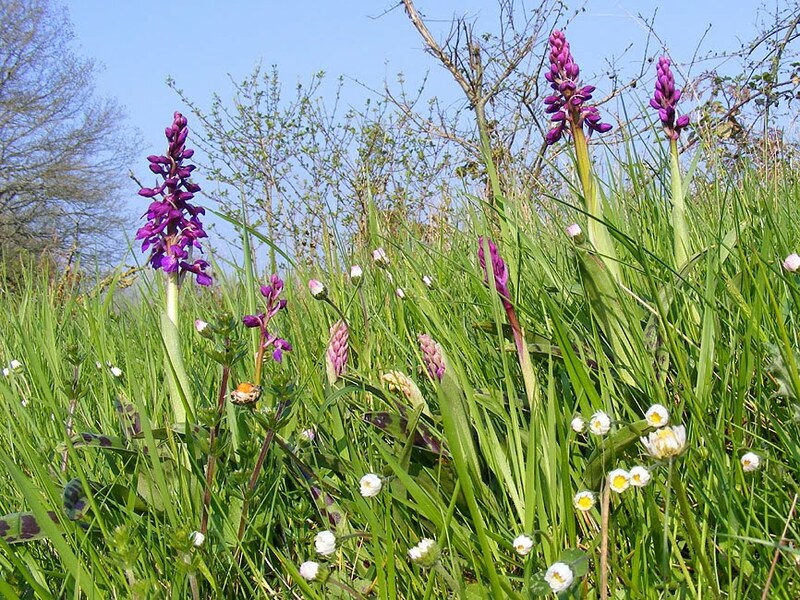 The orchid hotspot of which Preuilly-sur-Claise is the geographical centre is not particularly well known outside the area, overshadowed by the neighbouring Brenne in Indre, which has a couple more species and is famous enough to attract international orchid tourists. The main flowering season is May - June, when it is possible to see 25 species in a week if you know where to look. The two most productive habitats are damp grasslands and dry sunny calcareous banks. 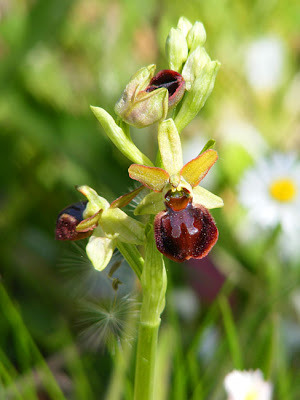 More information about the indigenous orchids of the area can be found on our website Loire Valley Nature. 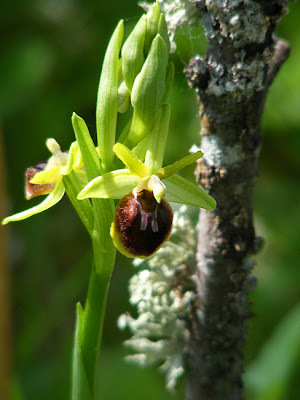 A checklist of all the possible species is here, and thumbnail photographs arranged by month to help you identify any orchids you find are here. 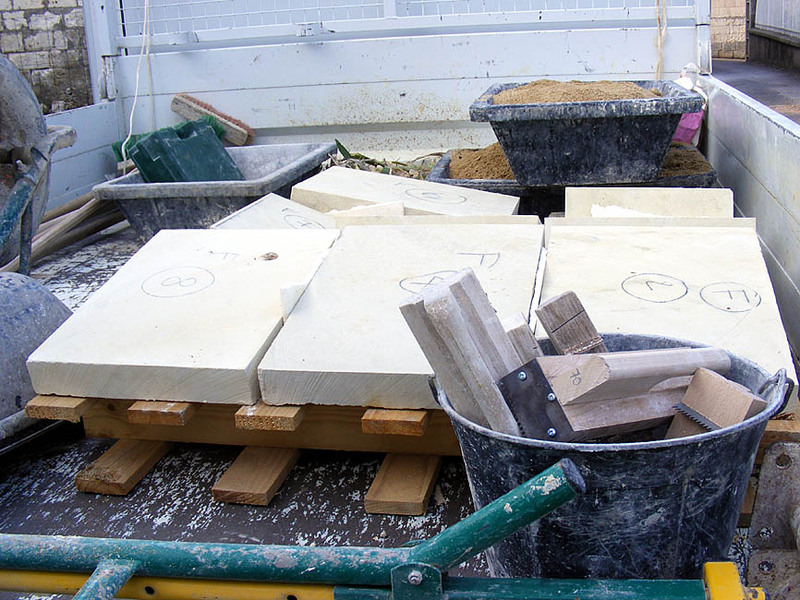 The masons arrived early yesterday, this time with the stones for the door frame. 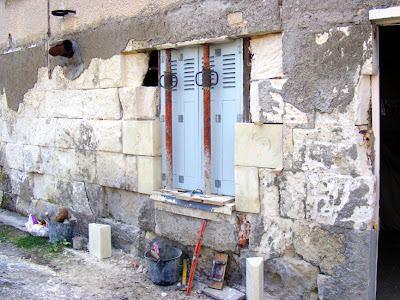 The old stones surrounding the door were in a similar state to the stones surrounding the window, with one noticeable exception - one of the stones (the side on which the door was hinged) was an 8 inch square post of oak with no visible support. We didn't realise it was there (or that it wasn't actually touching the ground) because it had been covered with a pine plank (which I had dutifully painted last year) at some stage. Once the post was out the remaining stonework was cut back, and the floor dug up to take our new threshold. 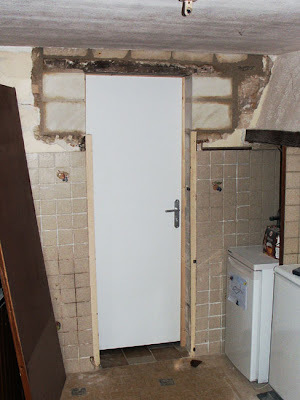 The door will be positioned about 30cm closer to the window than was previously the case, in order to get better stonework on the hinge side. 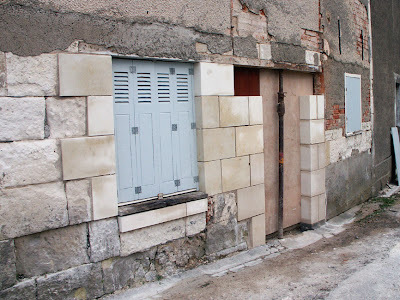 This caused the maçons some problems because the wall has a bit of a bend in it just where the new stonework starts, and the new wall and the old wall weren't aligning. It does mean Susan and I have had an increase in vocabulary, albeit one we can't use. were trying to make sense of the electric spaghetti. We had to go out in the afternoon to buy more stuff at BricoDepot. Because we were buying big heavy stuff (more on which sometime next week) we hired a truck from SuperU rather than have a repeat of our last visit but one. We took Stéphane with us, which meant that I didn't have to stand around looking confused, as I had a gentle hand to guide me. It all worked really well, except that we did rather get slowed down in the drive through section when they closed one caisse (checkout) and we were caught in a hardware store checkout traffic jam. This meant we were rather in a rush to get the truck back to SuperU before 6.45. We dropped Susan off at the supermarket to ask if it was a problem if we were 10 minutes late bringing the truck back, while Stéphane and I did a real rush job trying to get the truck unloaded. Half way through the unloading Susan rang to say "no rush, we can return the van tomorrow". This was a real relief. As we had left our car at the supermarket, Susan could then drive home and help with the unloading of the big and heavy (but so far secret) item. This is how our "back door" will look for the weekend. So this morning we are off to SuperU to return the van, hoping to get back before our neighbour arrives with a gift of tomato seedlings. 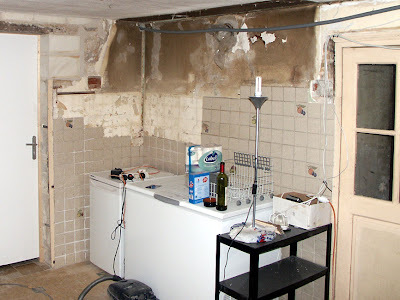 Then I hope to get some work done on the coin d'apéro, and fit in a trip to the déchèterie. Then, nicely rested, we can start work next Monday! M. Douady arrived with his team yesterday morning. 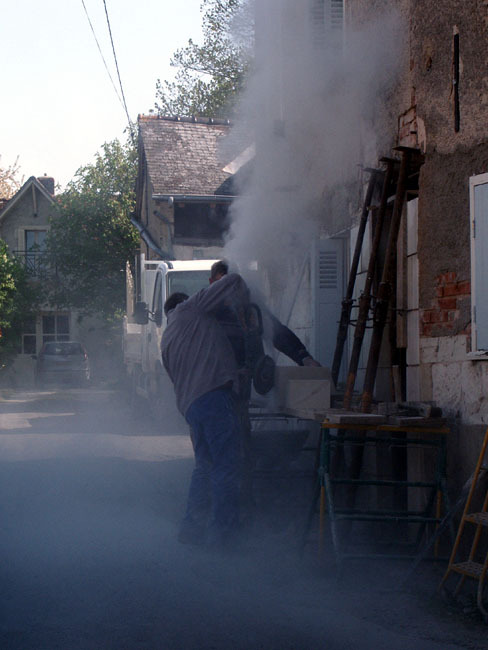 The great thing about the Maçons we noticed last year is that they just turn up and start working. Last year they built a chimney, this year they are replacing the stonework around our kitchen window and back door and a couple of windowsills. The stone around the opening was really decayed, and the door and windows changed the alignment of the walls every time we used them. This is not a good idea - not only did bits of stone keep falling off, but closing the door was becoming difficult. They arrived with the stone for the window surrounds pre-cut, and immediately marked out where they would be cutting and removing the existing stone. 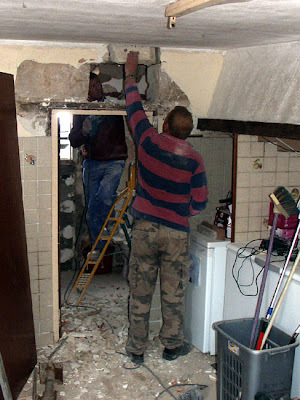 After a little drama (they came right through the wall, sending stone crashing inside) they started putting the new pieces in. 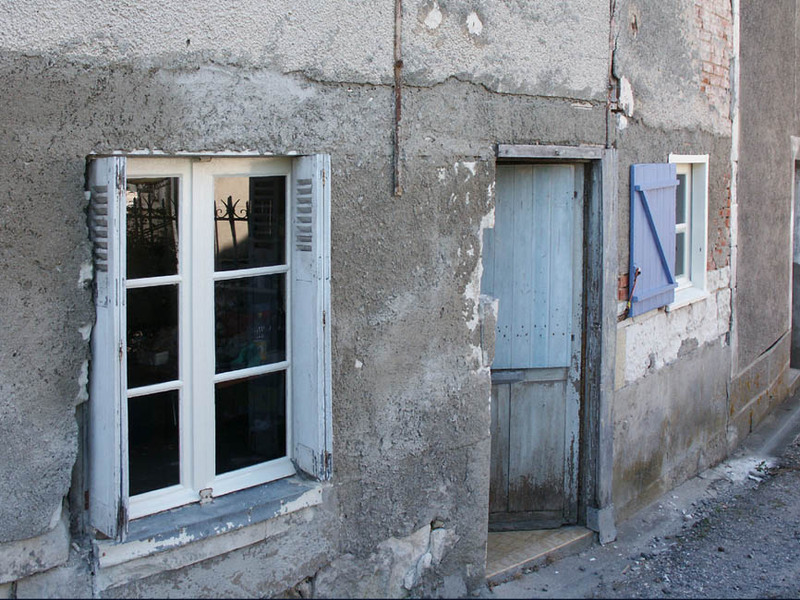 half the stones around the window had been replaced. Once the stone around the window had been replaced, they started demolishing the doorway. This surprised me somewhat, because the new door isn't here yet, and I thought they were going to wait to make sure they got the measurements perfect. Still - I am learning (or trying to learn) to leave these things to the experts - they know what they are doing, and me trying to manage them will never be totally successful. By going home time the hole where the door was/will be had been boarded up. Because they removed more stone than they expected, they needed to use and old door I had used in London as a tabletop and which somehow got brought over when we moved. We are impressed so far. 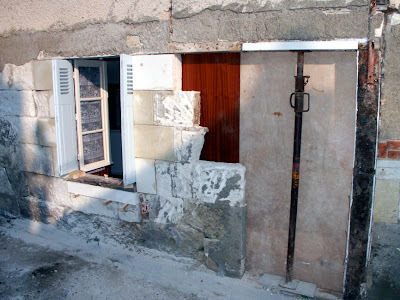 Tomorrow (I assume) they are replacing the window sill for our front bedroom, and maybe starting on raising the lintel of the toilet door. Preuilly yesterday. Compare it to a similar scene in October last year. 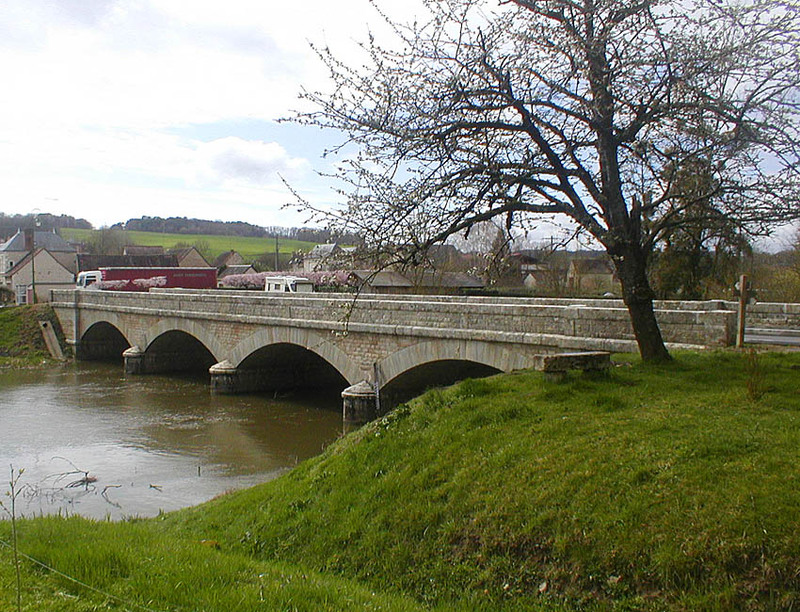 The bridge over the Claise at Chaumussay has been resurfaced recently and while they were at it they cleaned the stones. While they were at it, we think they have widened the footpaths (but can't really remember - we can say for sure that they have changed the access to the footpath: now we can't just get to the bridge from the carpark, but have to walk to the end of a ramp and new path. Here's what it looks like now, all pale, clean and lovely. It looked like this before – picturesque and calm, but with grey and mottled stones. We are progressing with the guest bedroom. 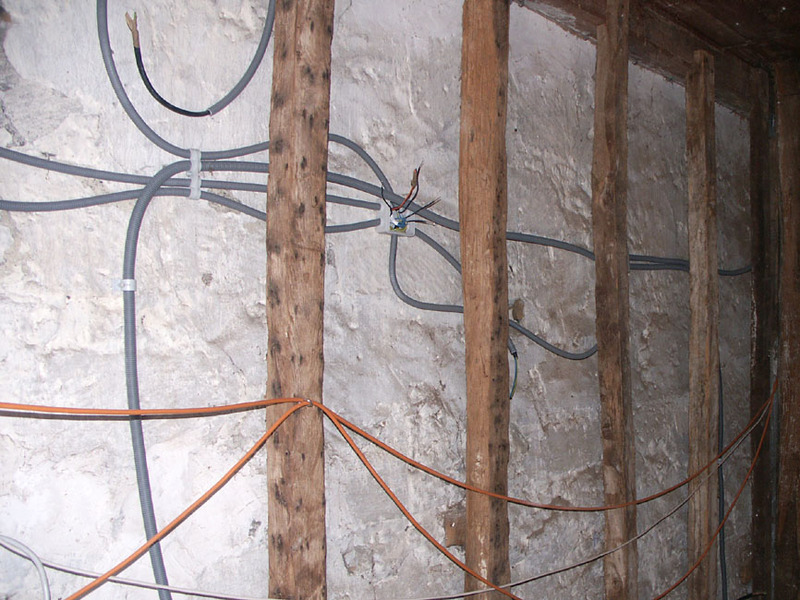 At close of play we had the exterior wall insulated and panelled, and all the wiring in place. 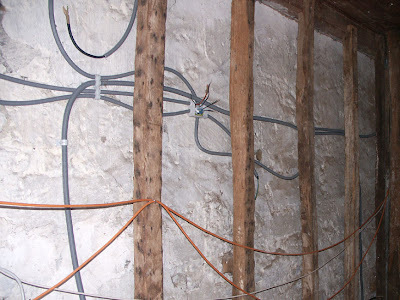 The insulation is 10cm (4 inches) of laine verre (glass wool) in a wooden frame, with all the wiring nicely hidden behind plaster board. Stéphane decided the insulation would be done properly (he spent 7 years in Montreal, where it gets properly cold) and has stapled the insulation to the frame - then taped and stapled again. 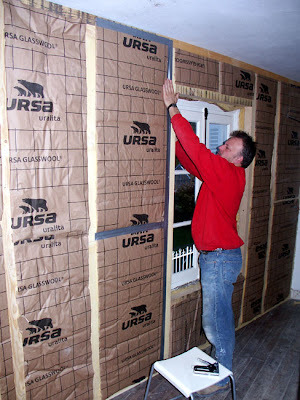 This means not only is there no gaps in the insulation, but it won't shift either, which cheers me up. 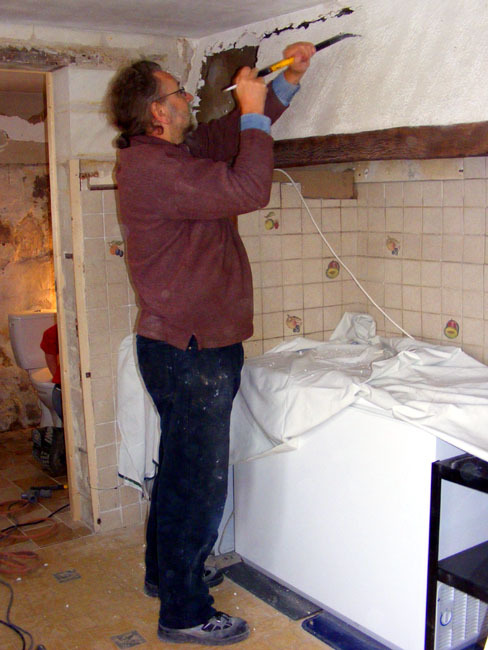 After the insulation was in, we put up the placo-plaque (plasterboard), cutting holes for the light switches and powerpoints. This is exciting - it all looks proper. Today we will be insulating and boarding the wall which is against the granary, and then we have someone coming in to tape all the joints. 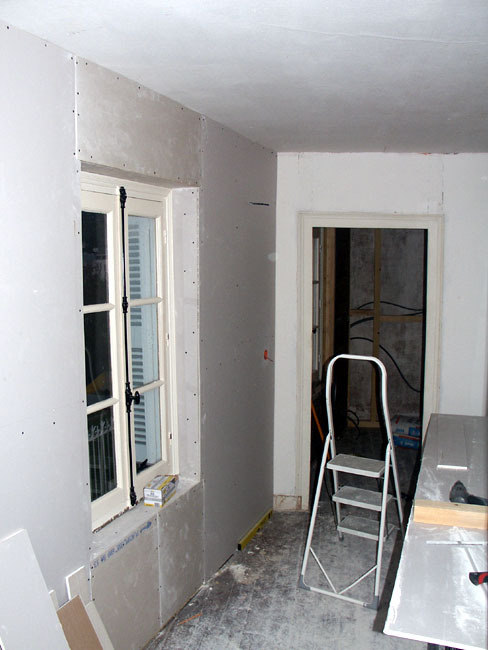 We will then limewash the walls - and we will have a proper, finished room (am I getting a little ahead of myself here?). We are also expecting M.Douady this afternoon (maybe...). 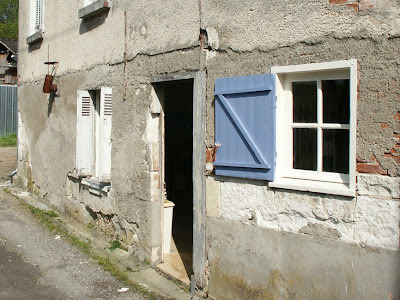 He will be replacing the stone sill in our bedroom, and replacing the stonework around the side door and kitchen window. He will also be making the door into the toilet a proper height (instead of chin height to me), which will be a relief to some people. There are one or two other jobs he will be doing, which we will talk about another time. I am conflicted (such a 21st century concept) about the guest bedroom. On the one hand, putting in 10cm of insulation and building plaster walls has made very little difference to how the room looks - which is good. On the other hand, the room looks little different - which is a pity after all the hard work we have put in. This rather impressive pile of muck is typical of the often steaming heaps of winter cattle shed sweepings that sit in fields all over the Touraine, waiting to be spread as fertilizer. Farmers here make huge quantities of straw, hay, silage and haylage and cattle are generally housed for the winter months, munching through the feed made during the summer and producing big piles of fertilizer in the form of their straw bedding mixed with cow pats. 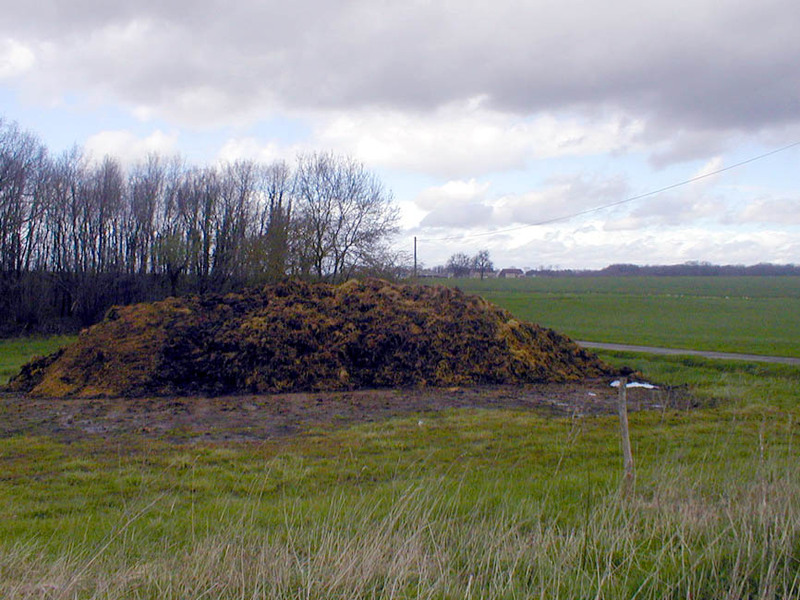 Some muck spreading is done in the spring, but it is also done in high summer. Travelling between Richelieu and Châtellerault can be an interesting olfactory experience in August. The pong seeping through the car vents and windows alternates between the very warm ripe melons sitting in the fields awaiting harvest and the smell of equally warm and ripe manure which has been newly flicked all over the earth of those fields that have already been cleared. 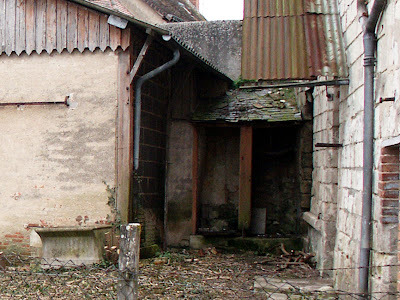 PS Cattle dung in French is not merde, it is bouse, but the temptation to start a blog post with 'Merde !' was too much for me. Will there be an Invasion this Year?